e.City Gold was the bus chosen to transport the members of the Council of Environment Ministers, which took place on June, 8th in Setúbal. 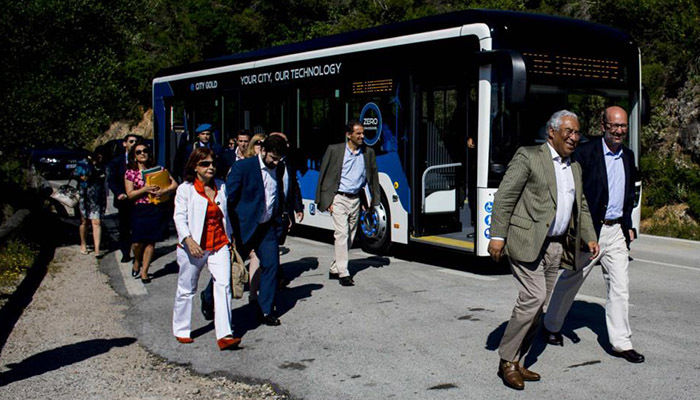 The new 100 % urban electric bus of CaetanoBus transported the governmental delegation, between Vila Nova de Azeitão and the Convent of Senhora da Arrábida, the venue for the Government working session. In order to raise awareness of environmental issues, the governmental members and the Prime Minister, António Costa, traveled using the new 100% urban electric bus of CaetanoBus. With the motto Your City, Our Technology, this bus was once again chosen for a public initiative, showing the country’s concern with the most demanding sustainability level. The vehicles main features, zero emissions, silence and reduced cost operations, were highlighted.